Capturing Venice : Scala del Bovolo - I never thought I'd climb these stairs! Venice has 'captured' the heart, mind and imagination of so many writers, poets, artists and historians. Venice is one of my favourite subjects in art, literature and history, and I am always eager to learn more and look more at this unique and special place. This Venice blog is my way of collecting the wealth of images, poems, prose and impressions of Venice. Scala del Bovolo - I never thought I'd climb these stairs! I've been coming to visit this spot, the Scala del Bovolo (Snail's Staircase) for almost twenty years. I'd stand outside the gates and look longingly up that extraordinary staircase. But I'd long given up hope that I'd ever see the inside of this building, let alone climb those stairs. And then, just as I was preparing to leave for Venice...I noticed that this site had finally opened to the public. Hoorah! 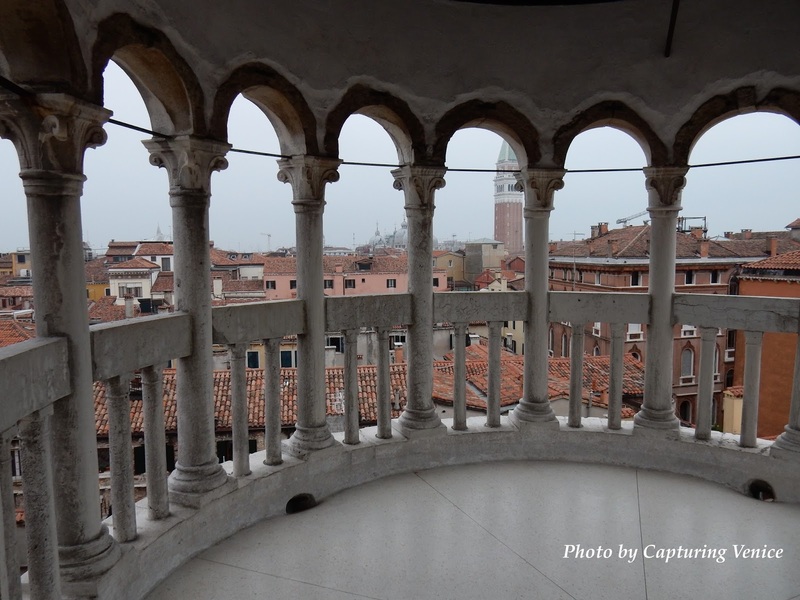 The view from the top of the 'snail' is intimate - I felt as though I could almost touch the Campanile in the Piazza San Marco or reach for that dear, familiar roof line of the Basilica di San Marco with its fat domes. Visiting the Scale del Bovolo was a delight - it was so much quieter than climbing the Campanile in Piazza San Marco...no queues, no crowds, no jostling for position. I had this little belvedere all to myself for several minutes. Many guidebooks seem describe the snail like form of the staircase as typical of Venice...I'd love to know where else this exists or existed, as I can't recall ever seeing it elsewhere in Venice. If you know anything further, please drop me a line in the comments box or via Capturing Venice's social media pages. I'd love to hear from you. The Scala del Bovolo was added to the existing Palazzo San Paternian around 1400 by commission from Pietro Contarini. We recently returned from our first visit to Venice --what a fabulous place! She did not disappoint. Unfortunately we did not visit the Snail's Staircase. There is so much to see and so many places to visit in Venice, but two of our favorites; Isola di San Michele (the island cemetery), and the living room of our rented apartment. The cemetery was an uncrowded, beautiful place where we saw only a few locals ---no tourists like ourselves! And, the view from our apartment windows which overlooked two canals that joined into one was amazing! Daily we enjoyed our morning espresso while watching the canal traffic. Thanks for sharing the information about the Snail's Staircase and giving us one more reason to return to Venice! Le coup d'oeil ne laisse pas à désirer même par temps gris lors de ma visite en avril. Les Idees Heureuses - merci pour votre commentaire! Salutations, Karen/ Capturing Venice. Scala del Bovolo is a great architecture of Roman time. It is situated in Venice. It is a small palazzo, best known for its external multi-arch spiral staircase. It is one of the best artifacts of Venice. People spend money and go there to see such beauty. Thanks for sharing the information about the architecture. Actually last time when I visit Venice I haven't saw this. Last time I start my tour with a Top Rated Venice Sightseeing Tours & Attraction Tickets company. They serve me well. As well as their behavior is polite and gentle. If you want to save some money then there is no better option than choose a package. Boat Trip: Glimpse Of Murano, Torcello And Burano Islands Tickets, Doge's Palace And St. Mark's Basilica Tour 2 Hours Tickets, Venice Marco Polo Airport Transfer: Shared Water Taxi Tickets, Venice Full Day Group Tour From Lake Guarda Tickets, Doge's Palace, St. Mark's Basilica And Venice Walking Tour Tickets, Walking Tour Of Hidden Venice And Iconic Gondola Ride Tickets these are some famous packages. Anyone can change their packages from http://www.tripindicator.com/tours/venice/attractions-grand-sightseeing-canal-gondola-serenade-boat-day-tours-tickets.html and can make their trip as they wish. So I think it is the perfect to utilize he beauty of Venice. Thanks for today. Venice and Paris - by word and image - by me and many eminent others. If you love Venice or Paris (or both), I invite you to take a walk alongside me as I discover these two cities. Venezia Contemporanea | Arte, architettura, cultura, idee e progetti di una città che vive. Share book reviews and ratings with Capturing, and even join a book club on Goodreads. 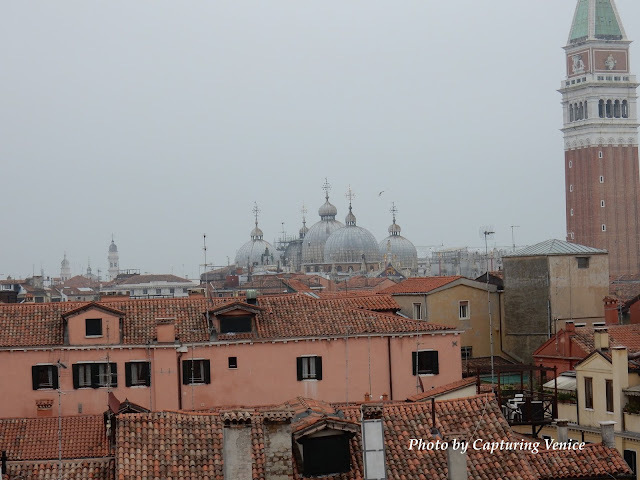 © Karen Worsfold author of Capturing Venice blog, 2012-2016 All Rights Reserved. Simple theme. Theme images by merrymoonmary. Powered by Blogger.